As I desperately try to complete the 90-card base of 2008 Upper Deck Masterpieces, I found a discounted blaster at Wal-Mart to see if I could knock a couple of cards off of my want list. Unfortunately, I did not get a single one of those cards, but I did get a Warren Spahn SP, as well as a Kosuke Fukudome rookie. I also pulled a jersey card of Jonathan Papelbon. 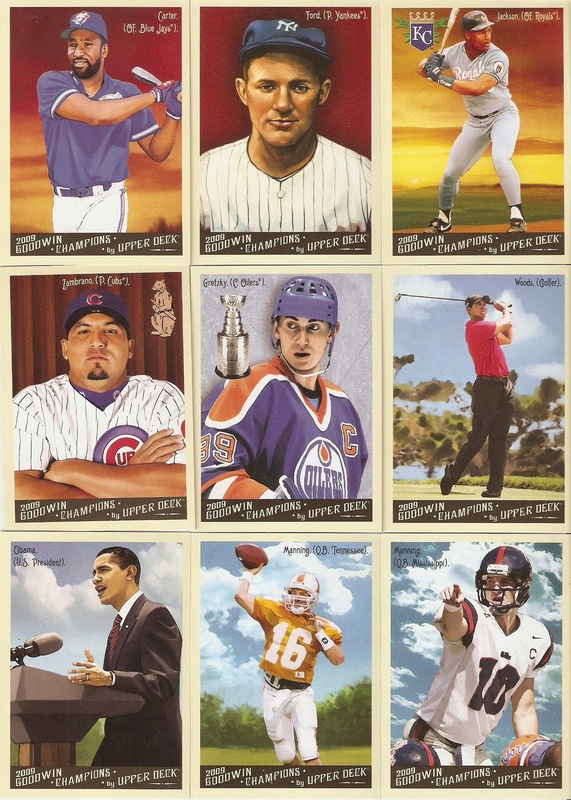 Like what Topps does with its Allen & Ginter relics, I love how Upper Deck went a little extra with these. Instead of cutting a hole in a base issue card (like Panini tends to do) they added a frame around it to give it that extra special look. 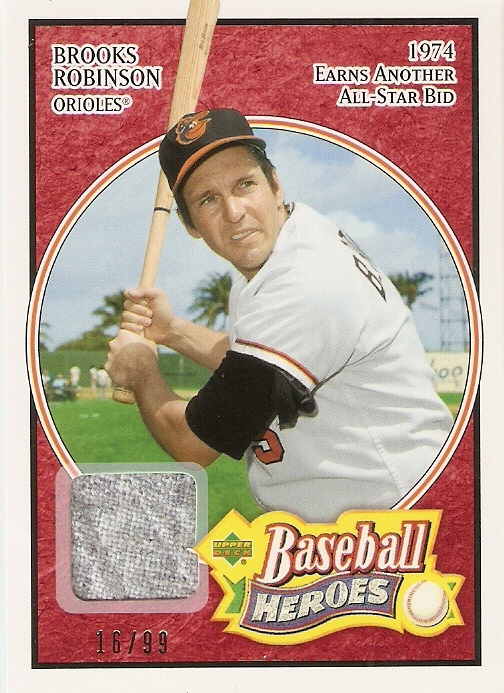 Even though relics are no longer that big of a deal in the hobby, I like that Upper Deck, at least for this release, treated them like one. Anyway, I now have a few extra cards from this set, so if anyone is looking for any, let me know. Wanted to get a post in while I was still awake, but at 12:30 in the AM, I'm not sure how longwinded I will be, not that I really ever am anyway. 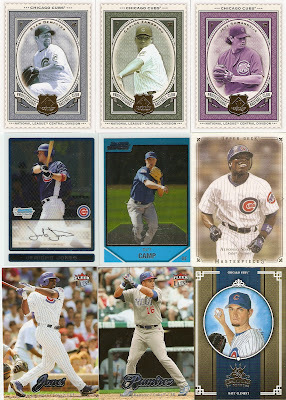 I made a trip to my LCS the other day and found four fantastic cards at four fantastic prices. My favorite out of the bunch is this Matching numbers relic from 2004 Leaf Limited featuring "Mr. Cub" and Ken Boyer. A cool concept, this insert set used jersey numbers as a reason to tie two players together. Not only is this my first Banks relic, but my first vintage relic of any Cub. The card is also serial numbered 3/100. I also picked up my first Ryno jersey from the 2008 Upper Deck Baseball Heroes set. 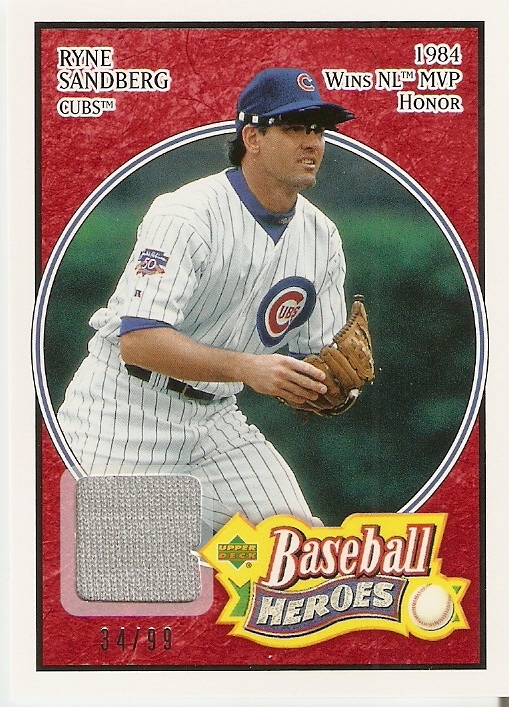 The red-paralleled card in serial numbered 34/99 and if you look closely at the swatches, you can really see how different the material was in Sandberg's and Banks's playing days. My third Cub relic is another addition to my Kerry Wood PC. 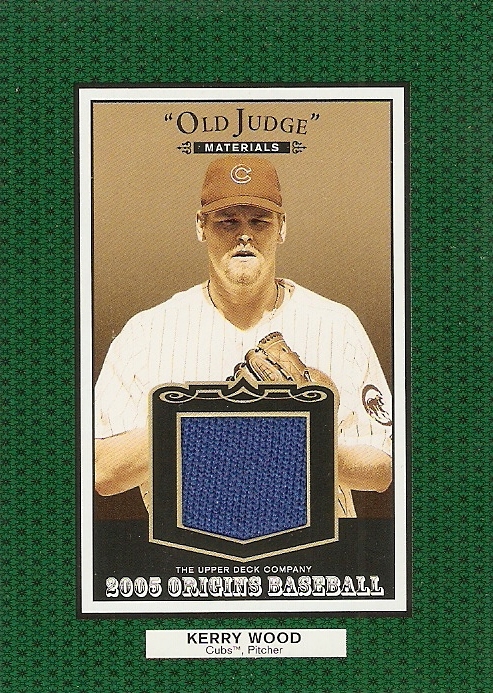 I found this blue relic from 2005 Upper Deck Origins and jumped at the chance to grab this card at a great price. 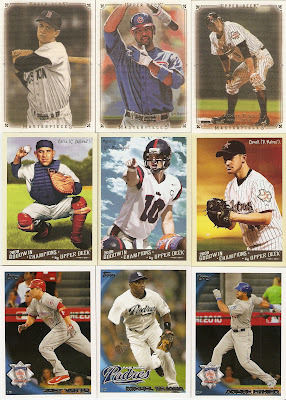 I also got a few blasters and Wal-Mart repacks to review over the next few days. Unfortunately, I have a major lazy streak in me, so we'll see what happens. Anyway, good night and happy trading! After spending THREE AND A HALF HOURS at my county's only DMV today to get a replacement copy of my driver's license, I decided that I deserve to spoil myself, even just a little bit. 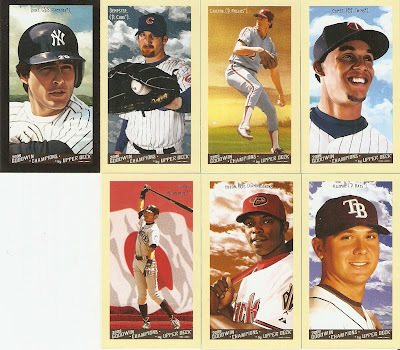 I stopped by a nearby WalMart and picked up a discounted blaster box of 2009 Upper Deck Goodwin champions and a rack pack of 2011 Topps Heritage. For those who have not seen my want list, I am trying to put together the ENTIRE Goodwin set, so I jumped at the chance to get those cards at that price. They only had one blaster, and out of 40 base set card (I also got 7 minis and 1 20th Anniversary card) 34 were cards I was missing. Needless to day, this was a FANTASTIC blaster to help me build this set. 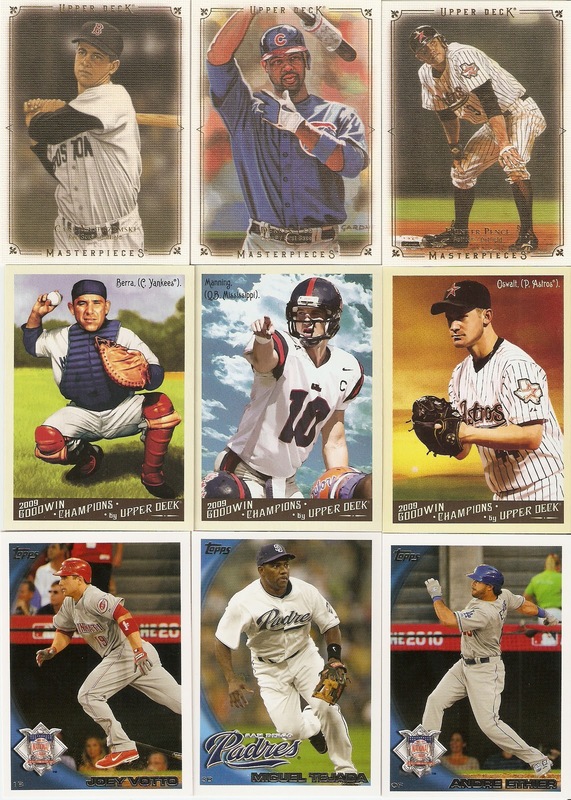 The minis yielded me one Gypsy Queen blackborder of the player Dennis Leary refers to as "Bucky F***ing Dent" and a few others, including Ryan Dempster (for my Cubs collection), Scott Kazmir (for my player collection) and Ichiro (not for any collection, but a REALLY cool looking card). 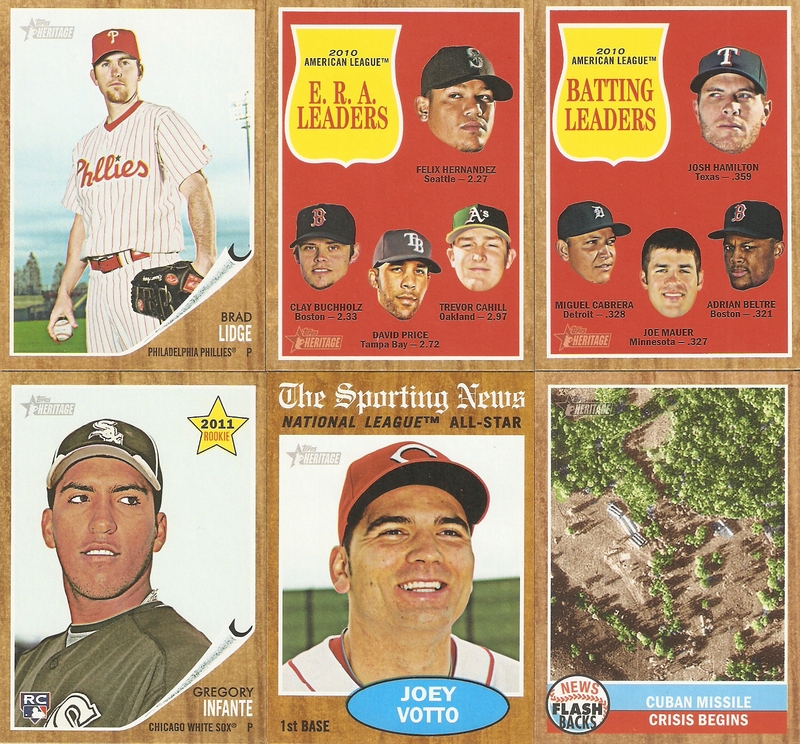 I also spotted some 2011 Topps Heritage and figured, what the heck. I wasn't expecting much from it, but curiosity got the best of me and I got myself a rack pack. I REALLY like what Topps has done with their Heritage line. I know some people aren't that into this year's set, they have really remained faithful to the look and feel of the original set. 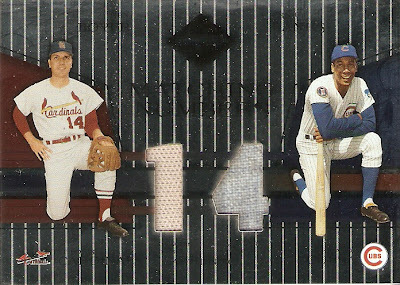 They even went so far as to put a different style of card number of 1-110 from the rest (just like in '62). Plus, they made the photos look just the same as the 1962 quality without making them look retouched. Needless to say, a good day at Wal-Mart. Happy trading, everyone. I just wanted to do a quick post here about a FANTASTIC trade I completed with Greg at Plaschke, Thy Sweater is Argyle. This is the second trade I have completed with Greg and while the first one revolved around helping each other complete a few sets, this one mostly revolved around swapping some hits. 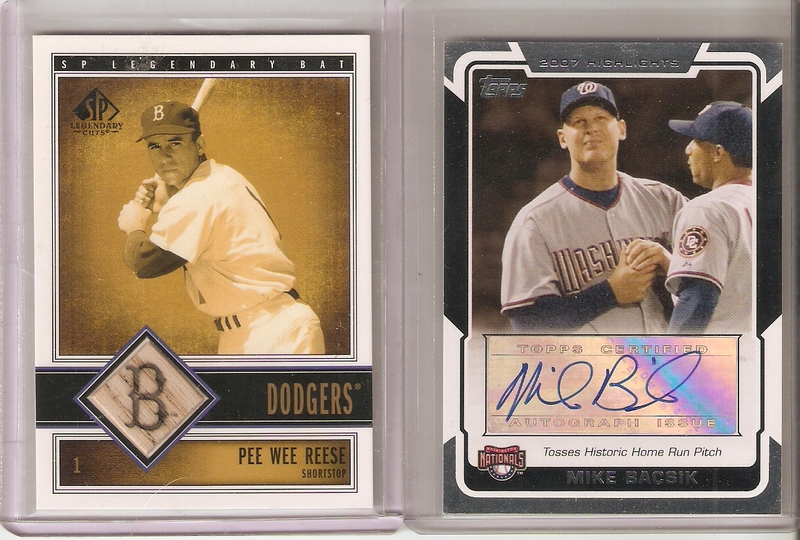 Since Greg is a Dodgers fan, I was incredibly fortunate to pry the Pee Wee Reese bat relic from his hands. Luckily, he had another of Reese's bat cards and didn't really like the logo embossed on the wood. In my opinion, any time you can get that fantastic looking Brooklyn logo on a card, go for it. I also got an auto of Mike Bacsik, who famously gave up Barry Bonds' career record-breaking home run. It'll go great with my Tracy Stallard autograph (he gave up Maris's 61st). I also managed to get a few hockey hits from Greg. There aren't a ton of hockey collectors out there, so when I find one, I jump at the chance for a good trade. 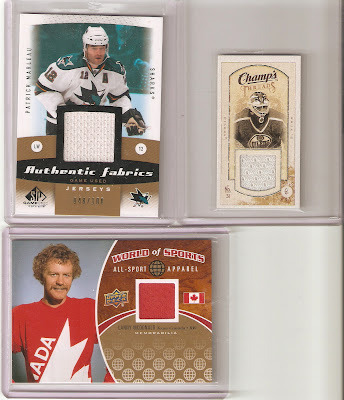 He sent me a Patrick Marleau (48/100) from SP Game Used, a Grant Fuhr from Champ's and a Lanny McDonald from World of Sports. Two hall-of-famers and a low SN. Not bad at all. To top it all off, we also swapped some vintage cards from our favorite teams. 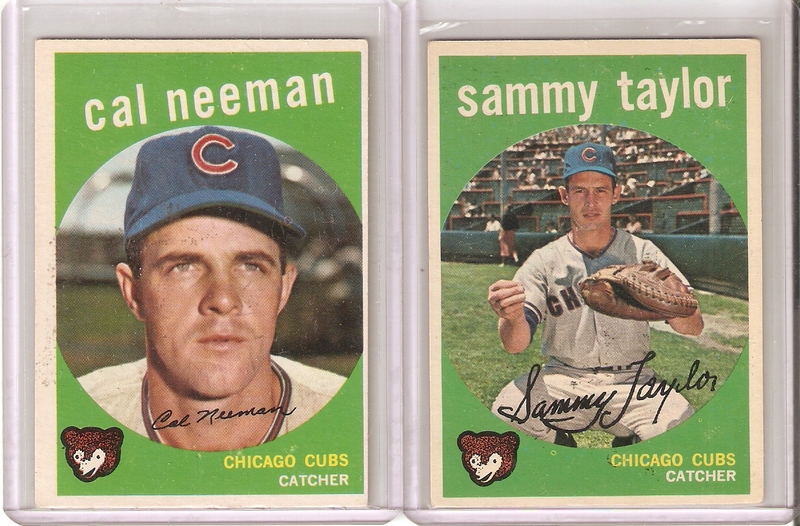 I sent him two Dodgers from the early '60s and he sent me two Cubs from '59. Thanks for the trade, Greg. I look forward to many more in the future. I received a couple of cards in the mail from Steve, a self-described "reader of many baseball blogs, writer of none." With no expectations of anything in return, he sent me two cards to knock off of my 2008 Masterpieces want list. Thanks, Steve!!! Hey everybody. Don't have a ton of time here, but I wanted to post about a couple of trades while I have a few minutes. The first is from Ryan at "O" No!!! Another Orioles Blog. In exchange for a few Orioles cards from my collection, he sent me quite a few cards from my Want List, including 2010 Topps Update, 2008 Masterpieces and 2009 Goodwin Champions. He also sent me the LAST card I needed to finish of my 2010 Allen & Ginter regular-sized card set (Regular, SP, This Day in History and Baseball Sketches). Thanks for the trade. 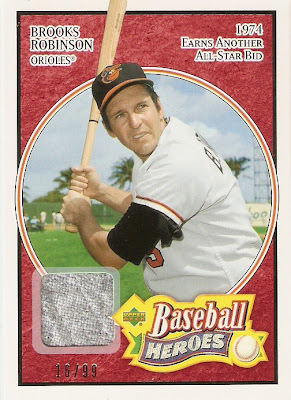 The next trade wasn't really a trade at all, but rather, free cards from Ted at Crinkly Wrappers. He came to the realization that he had way too many cards from 2010 Update, so was generously giving them out to whoever could use them more than he could. I didn't even request these at first. I simply put in a response to a completely unrelated blog post and he went that extra mile to check out my want list and sent them on their way. Not only that, but there were a few REALLY cool Chicago Cubs cards included. Thanks Ted!!! Packages went out today for Ryan, Sam at The Daily Dimwit, and Greg at Plaschke, Thy Sweater is Argyle. Speaking of Sam, head over to his blog for a really cool contest that could get you a $35 credit toward any purchase at CSN Stores. They sell everythin g from appliances to baseball cards, so give it a shot. Five prizes will be given out in total, so there's a big chance you'll walk away with something. The Lost Collector is holding a contest relating to the NCAA Big East Tournament. 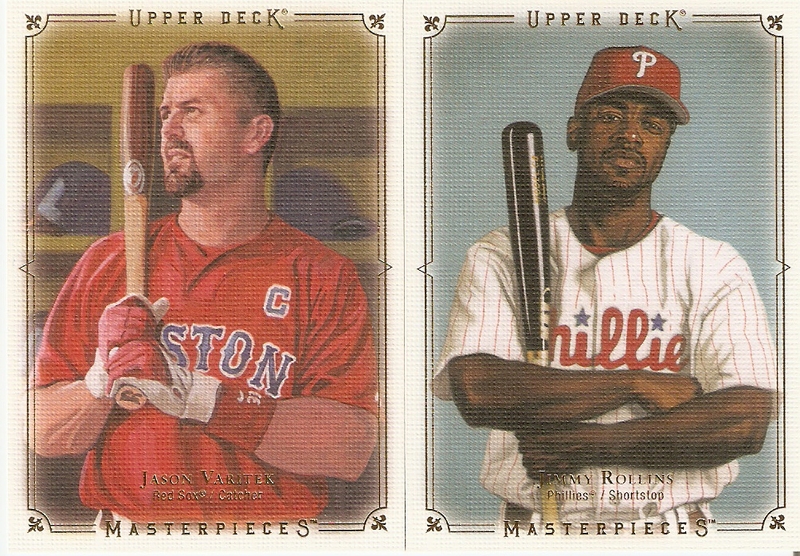 Just name the winner, and you have a shot at some relic cards.